If your computer is infected with “Hacked by Godzilla Virus”, it gets displayed this weird message “Hacked by Godzilla” whenever you open any site from your Internet Explorer (IE) web browser. Godzilla virus changes your Internet browser by adding the words “Hacked by Godzilla” across the top. Hacked by Godzilla virus is one of those difficult viruses to handle which often escapes from most of the anti-virus software. How frustrating it would be when your anti-virus software is not able to detect and clean this “Hacked by Godzilla Virus”? But don’t get frustrated anymore, because here is the step-by-step tutorial on how to remove Godzilla virus manually which is easy to follow and bound to get results for sure. Download the freeware task manager and process analyzer called ‘Process Explorer’ from filehippo.com/download_process_explorer/ and Run it. It will show you detailed information about all the processes running on your PC including its icon, command-line, full image path, memory statistics, user account, security attributes, and more. From the list of processes running, find ‘wscript.exe’ and close/delete it. Download RRT (Remove Restrictions Tool) from www.majorgeeks.com/files/details/rrt_(remove_restrictions_tool).html. This tiny tool can re-enable and bring back all the system options and services Godzilla virus had disabled in order to make himself hidden. Go to Start ► Run and type regedit which open Registry Editor window. Now go to the registry key HKEY_CURRENT_USER/Software/Microsoft/Internet Explorer/Main and delete “Window Title” which has its value of “Hacked by Godzilla”. Remove the name in that value or if you want to show your name in the browser title, give your name in that value. 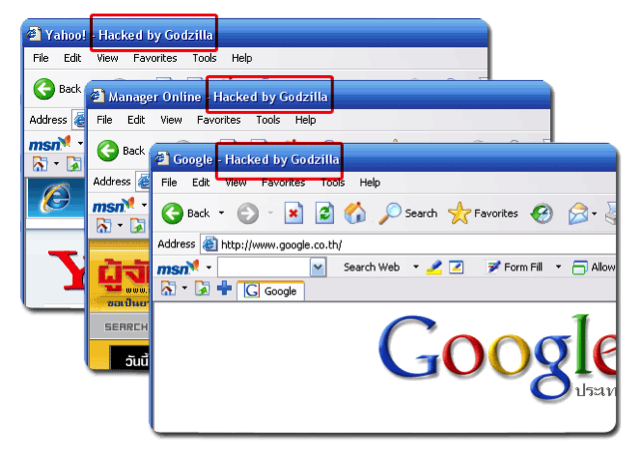 Hope these tips can help you remove “Hacked by Godzilla Virus” manually without using any anti-virus software.